10 No Brainers to Make Toronto More Awesome! > Check out all 10 videos on the CCE’s Vimeo page. > Read the info posters below. 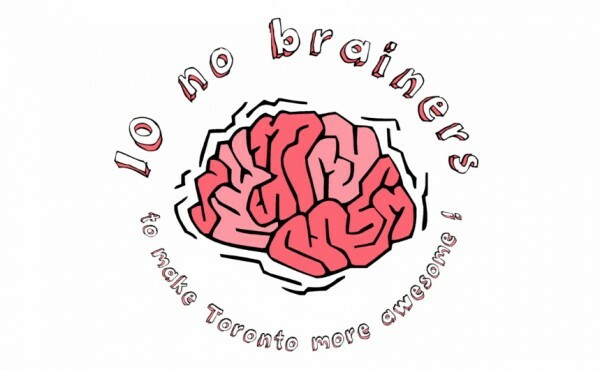 10 No Brainers celebrates simple, achievable ideas to make Toronto more awesome, right now. A diverse group of contributors have shared their ideas to precipitate positive change in Toronto’s neighbourhoods. With our media partner, Spacing Toronto, we released 10 short video interviews with our contributors to explore their ideas for a No Brainer: a simple alteration to City bylaws, fees, or administrative processes that could improve life in Toronto’s neighbourhoods, right now. The project coincided with the upcoming municipal election, so we hosted our first pop-up event at Spacing’s Election Issue launch party on October 02 where we debuted our info posters and let residents vote on their favourite No Brianer Idea. We joined in at CSI’s Turnout Toronto event on October 22 where we displayed our info posters, asked visitors to vote for the No Brainer idea that they were most excited about, and spoke to residents about what ideas they had for the future of their city. Click on the posters below to read the full-size versions.